× 4 = 16 Required Please enter the correct value. After the U.S. Federal Reserve announced yesterday (Wednesday) that the central bank would extend Operation Twist, the markets dipped then climbed back to finish basically flat for the day. Today all three major indexes are down nearly 2% or more. The Dow Jones sunk more than 250 points, or 1.96% to 12,573.57. The S&P 500 fell 2.23% to 1,325.51. So when will the fun begin, if ever, following this new dose of stimulus? That's what Money Morning Executive Editor William Patalon III wanted to find out. In his Private Briefing newsletter yesterday, he asked Money Morning Chief Investment Strategist Keith Fitz-Gerald what investors should expect following this latest Fed move. How will it affect stock prices? And how should investors respond to yesterday's central bank move? First, Keith delivered the bad news. Operation Twist isn't an economic cure-all. In fact, it's more of a Band-Aid that will fail to fix the actual problems. But the good news is the new stimulus measure — "Son of Twist" as Keith called it — should infuse some life into the stock market. Keith explained to Bill that investors shouldn't stay away from the stock market just because "Son of Twist" won't do much to help the struggling U.S. economy. In fact, Keith said that staying out of the markets would be a mistake. "They're two totally different things right now, BP," Keith said. "And no matter how bad you feel [about the country's economic outlook], or how terrible things look, you have to make sure you participate in this market." What Keith is saying is that given the Fed's action yesterday, there's a high probability that U.S. stocks will surge. If you don't have some money invested in the U.S. market, you'll miss the rally and get left behind. It's happened time and time again. Historically stocks have responded very well to interest rate reductions by the Fed, and this is similar to a rate cut. It's just another way of pumping liquidity into the economy as well as the financial markets. 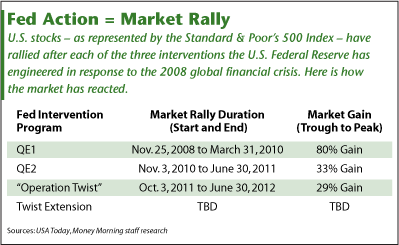 The accompanying chart shows the performance of the most recent stock rallies following each stimulus measure. Data shows that the last three stimulus measures have created strong surges in the U.S. markets. This time should be no different, especially when combined with the Eurozone crisis and the potential for an increase of foreign investors to the market. "You really have no choice — you have to play the game," said Keith. "If you walk away now — when the entire world is dependent on cheap money — you risk getting left so far behind that you'll never catch up." As Bill put it, you don't want to be sitting on the sidelines missing the rally and watching all those institutional investors rake in the gains. Rate cuts usually take time to show up in the markets, so there should be a window of opportunity to take action before the Fed's latest intervention takes effect. Looking at the U.S. markets between 1946 and 2007, in the first six months after a rate cut the S&P 500 rose only 62% of the time. But 12 months after the rate reduction, stocks rose 85% of the time. So how should investors go about playing the new "Twist," but also protect themselves if the rally isn't as big as expected? Keith and Bill put together five guidelines that allow investors to benefit from any market upside and minimize any downside. To get those five guidelines – and to gain access to all of Bill's private briefing pieces – click here. Is the Fed's Operation Twist Just the Start of More Stimulus? Is The Rally For Real…Or Just Part Of the Games Bankers Play?